Anabel Quan-Haase is Associate Professor of Information and Media Studies and Sociology at the University of Western Ontario. Dr. Quan-Haase received her Masters degree in Psychology from the Humboldt-University in Berlin in 1998 under the supervision of Dr. Herbert Hagendorf and her Ph.D. in Information Studies from the University of Toronto in 2004 under the supervision of Dr. Lynne Howarth and advisory committee members Barry Wellman, Chun Wei Choo and Derick de Kerckhove. She engages in interdisciplinarity, knowledge transfer, and public outreach. Her focus is on social change, social media, and social networks. 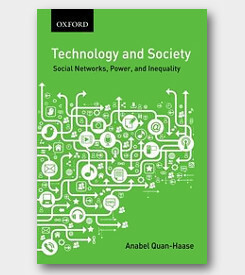 She is the co-editor of the Handbook of Social Media Research Methods with Luke Sloan (Sage, 2017) and the co-author of Digital Society with Lorne Tepperman (Oxford University Press, 2017) as well as the author of Technology and Society (Oxford University Press, 2016). Her work has appeared in top journals of the field including New Media & Society , Journal of Computer-Mediated Communication , Information, Communication & Society , Journal of the Association for Information Science and Technology (JASIST), The Information Society , Journal of Documentation , Information Research , Big Data + Society , and Journal of Social and Personal Relationships . Andrew Nevin (jointly supervised with Paul-Philippe Pare), Cyber-psychopathy: Examining the Relationship Between Dark E-personality and Online Misconduct. Tara Price, University Social Media Adoption Trends and Usage Patterns. Brendan Watts (jointly supervised with Michael Gardiner), Capitalism Flies Through Space: A Marxist Analysis of Capitalist Ideology Within the Video Game Eve Online. Michael Haight, Revisiting the Digital Divide in the Canadian Context . Caitlin Oleson, Seeking Help in the Digital Age: Factors Contributing to Support Mobilization in the 21st Century. David Wang, The Internet and Political Engagement: Examining the Relationship Internet Usage Has On Political Engagement. Jordana Warner, The Internet as a Medium for Health Promotion and Prevention for Young Adults. (2018) Real-Life Sociology: A Canadian Approach (with Lorne Tepperman), Oxford University Press. (2017) The SAGE Handbook of Social Media Research Methods (ed. with Luke Sloan), Sage Publishing. (2017) "The coming together of a community of practice: Commemorative tattoos as visual culture for community engagement and identity formation" in D. Davidson (ed.) The Tattoo Project: Visual Culture and the Digital Archive , Canadian Scholars’ Press. (2017) "Technology and mass media" (with D. Young) in L. Tepperman & P. Albanese (eds. ), Principles of sociology: A Canadian perspective (5th ed. ), Oxford University Press. (2017) "Introduction to the handbook of social media research methods: Goals, challenges and innovations" (with L. Sloan) in L. Sloan & A. Quan-Haase (eds. ), The SAGE Handbook of Social Media Research Methods , Sage Publications. (2017) "Critical reflections on social media research practices: Ethical decisions, big-small data rivalries and 6V challenges" (with L. Sloan) in L. Sloan & A. Quan-Haase (eds. 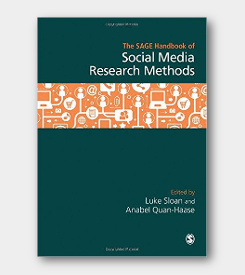 ), The SAGE Handbook of Social Media Research Methods , Sage Publications. (2017) "The virtual self on social media: The impact of online reputation management, trolling, and personality traits" (with S. Yang, Y. Chen, A. Nevin) in L. Sloan (eds. ), The SAGE Handbook of Social Media Research Methods , Sage Publications. (2017) "Building interdisciplinary social media research teams: The benefits, challenges and policy frameworks" (with L. McCay-Peet) in L. Sloan & A. Quan-Haase (eds. ), The SAGE Handbook of Social Media Research Methods , Sage Publications. (2017) "What is social media and why it matters" (with L. McCay-Peet) in L. Sloan & A. Quan-Haase (eds. ), The SAGE Handbook of Social Media Research Methods , Sage Publications. (2017) "Social network analysis" (with L. McCay-Peet) in K. J. Bruhn & R. T. Craig (eds. ), International Encyclopedia of Communication Theory and Philosophy , Wiley. (2016) "A model of social media engagement: User profiles, gratifications, and experiences" (with L. McCay-Peet) in H. O’Brien & P. Cairns (eds. ), Why engagement matters: Cross-disciplinary perspectives and innovations on user engagement with digital media , Springer Verlag. (2016) "Technology and society: A Canadian perspective" in L. Tepperman & P. Albanese (eds. 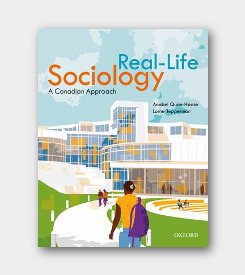 ), Sociology: A Canadian Perspective (4th ed), Oxford University Press. (2015) "‘A workers’ inquiry 2.0’: An ethnographic method for the study of produsage" (with B. Brown) in C. Fuchs & V. Mosco (eds. ), Marx in the Age of Digital Capitalism , Brill. (2014) "The new boundaries of search: Serendipity in digital environments" (with L. McCay-Peet) in B. Stark, D. Dörr & S. Aufenange (eds.) The "Googlization" of society: The utilization and regulation of search engines , De Gruyter. (2014) "The festivities of Santo Tomás in Chichicastenango: Technologies of representation as a means of identity expression in the Hispanic Baroque" (with K. Martin) in J. L. Suárez & J. Magallonez (eds. ), The Hispanic Baroque , Liverpool University Press. (2014) "The impact of digital resources on scholarship in the digital humanities" (with K. Martin) in M. Khosrow-Pour (ed. ), Encyclopedia of information science and technology , (3rd ed) IGI Global. 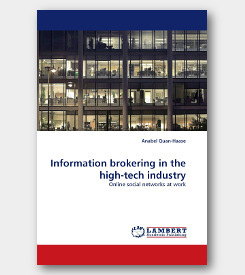 (2014) "Cyber knowledge brokering" (with D. Onaifo) in M. Khosrow-Pour (ed. ), Encyclopedia of information science and technology , (3rd ed) IGI Global. (2014) "The role of serendipity in digital environments" (with J. Burkell and V.L. Rubin) in M. Khosrow-Pour (ed. ), Encyclopedia of information science and technology , IGI Global. (2014) "Categorizing blogs as information sources: Implications for libraries and information science" (with M.S. Scale) in M. Khosrow-Pour (ed. ), Encyclopedia of information science and technology , (3rd ed) IGI Global. (2014) "The uses and gratifications (U&G) approach as a lens for studying social media practice" (with A.L. Young) in R. Fortner & M. Fackler (eds. ), International handbook of media and communication theory , Blackwell. (2017) "Connected seniors: How older adults in East York exchange social support online and offline" (with G.Y. Mo and B. Wellman) Information, Communication & Society . (2017) "Problematizing the digital literacy paradox in the context of older adults’ ICT use: Aging, media discourse, and self-determination" (with K. Schreurs, K. Martin) Canadian Journal of Communication 42(2). (2017) "Stak—Serendipitous tool for augmenting knowledge: Connecting digital and physical resources" (with B. Greenspan and K. Martin) Digital Studies 7(1). (2016) "The role of agency in historians’ experiences of serendipity in physical and digital information environments" (with K. Martin) Journal of Documentation 72(6): 1008-1026. (2016) "Illusions of a “Bond”: Tagging cultural products across online platforms" (with N. Desrochers, A. Laplante, K. Martin, and L. Spiteri) Journal of Documentation 72(6): 1027-1051. (2016) "The changing public sphere on Twitter: Network structure, elites, and topics of the #righttobeforgotten" (with S. Yang and K. Rannenberg) New Media & Society . (2016) "Interviews with digital seniors: ICT use in the context of everyday life" (with K. Martin and K. Schreurs) Information, Communication & Society 4(5): 691-707. (2015) "Networks of digital humanities scholars: The informational and social uses and gratifications of twitter" (with K. Martin and L. McCay-Peet) Big Data & Society 2(1): 205395171558941. (2015) "Romantic breakups on Facebook: New scales for studying post-breakup behaviors, digital distress, and surveillance" (with V. Lukacs) Information, Communication & Society 18(5): 492-508. (2015) "Digital inequalities and why they matter" (with L. Robinson, S.R. Cotten, H. Ono, et al.) Information, Communication & Society 18(5): 569-582. (2015) "Collaborating, connecting, and clustering in the humanities: A case study of networked scholarship in an interdisciplinary, dispersed team" (J.L. Suarez and D.M. Brown) American Behavioral Scientist 59(5): 565-581. (2015) "Blogging the city: Research, collaboration, and engagement in urban e-planning. Critical notes from a conference" (with P. Clavel, K. Fox, C. Leo, D. Saitta, & W. LaDale) International Journal of E-Planning Research 4(1): 54-66. (2014) "Not all on the same page: E-book adoption and technology exploration by seniors" (with K. Martin & K. Schreurs) Information Research 19(2): paper 622. (2014) "Are social media ubiquitous in academic libraries? A longitudinal study of adoption and usage patterns" (with G. Collins) Journal of Web Librarianship 8(1): 48-68. (2014) "Revisiting the digital divide in Canada: The impact of demographic factors on access to the internet, level of online activity, and social networking site usage" (with M. Haight and B. Corbett) Information Communication & Society 17(4): 503-519. (2016) "Digital sociology and information science research" (with D. Greyson, N.A. Cooke, and A. Worrall) in D. H. Sonnenwald & L. Harrison (eds. ), Proceedings of the 79th ASIS&T Annual Meeting, Copenhagen, Denmark: ASIS&T. ACM Digital Library. (2015) "Authorship, patents, citations, acknowledgments, tweets, reader counts and the multifaceted reward system of science" (with N. Desrochers, A. Paul-Hus, T.D. Bowman, R. Costas, S. Haustein, V. Larivière, and A. Tsou) Proceedings of the 78th ASIS&T Annual Meeting: Information Science with Impact: Research in and for the Community, 52(1), 1-4. ACM Digital Library. (2015) "Research on serendipity: The methodological challenges of time and language" (with L. McCay-Peet) [Poster]. Proceedings of Canadian Association of Information Studies, Ottawa, ON, June 3-5. (2015) "A matter of time and academic discipline? Exploring the use of resources" (with L. McCay-Peet, D. Kern, and P. Mutschke) Proceedings of the Canadian Association of Information Studies, Ottawa, ON, June 3-5. (2015) "The use of technology in the “Third Age”: Findings from the effects of digital technology on seniors (EDITS) Project" (with K. Martin, and K. Schreurs) Proceedings of the Canadian Association of Information Studies, Ottawa, ON, June 3-5. (2014) "An exploration of approaches to the support of serendipity in digital environments" (with L. McCay-Peet) [Poster]. Proceedings of Canadian Association of Information Studies, Brock, ON, June 3-8. (2014) "Not all on the same page: E-book adoption and technology exploration by seniors" (with K. Martin, and K. Schreurs) Proceedings of Canadian Association of Information Studies, Brock, ON, June 3-8. (2014) "Information and marginality: Ethical issues" (with I. Bayo Urban, J. Budd, N. Caidi, N. Changfoot, A.D. Andrade, A.D. Dosono, R. Gomez, and M. Wolske) Proceedings of iConference 2014, Berlin, March 4-7. (2014) "Interviews with lifelong readers: Preliminary findings from the EDITS (Effects of Digital Information Technology on Seniors) Project" (with K. Martin and K. Schreurs) [Poster]. Proceedings of iConference 2014, Berlin, March 4-7. 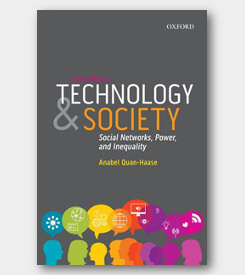 Anabel Quan-Haase’s research interests lie in the area of computer-mediated communication, the networked society, social networks, and new media and social change. Her current research projects examine how young people use instant messaging, Facebook, mobile phones and other communication tools and what the social consequences are for their social relations, community, and social capital. June 24, 2015 "Digital Environments for the Humanities"
May 30, 2014 "Discovery 14: Hyperconnectivity and the Internet of Everything - Panel Presentation"
Mar. 20, 2013 "Social Network Analysis: Examining Community Level Effect"
Mar. 19, 2013 "Serendipity Models: How We Encounter Information and People in Digital Environments"
Dec 12, 2012 "Revisiting the Digital Divide: Findings from the 2010 Canadian Internet Use Survey"
Sept. 27, 2012 "Serendipity Models: How We Encounter Information and People in Digital Environments"
Dec. 1, 2007 "McOndo Online: New Forms of Literary Expression"